If you traveled downtown at all this weekend, you may have spotted folks hawking an unfamiliar newspaper. The St. Petersburg Homeless Image — a forum for advocates, homeless and formerly homeless people, students and the general public — made its debut this weekend on the streets of St. Pete. The paper includes articles on the homeless lawsuit against the city, St. Pete’s designation as “Second Meanest City,” a blistering attack on the St. Petersburg Times for their recent article against panhandling and passionate obits on recent street people who died. The paper is the brainchild of G.W. Rolle, a formerly homeless man who serves on the county’s Homeless Leadership Network. The project grew out of a need to provide accurate, passionate news and opinions to the people of St. Pete during an unusually hostile atmosphere toward the homeless. Plus, through a generous vendor program, the paper provides an economic opportunity to the city’s homeless. They can sell the paper for a profit and, besides getting some extra cash, learn valuable job skills. Rolle told me it’s a good alternative to panhandling. The idea is nothing new. In 19 cities throughout the United States and Canada, “street newspapers” have proven effective in giving homeless people a “hand-up” instead of a “hand-out.” Street newspapers even have a national umbrella organization backing them. If you pick up a copy — and you should — you’ll find a few articles written by myself and some homeless advocates across the county. The design and editing needs a little work, but the St. Petersburg Image is a good example of the kind of alternative journalism we need in St. Pete. Interesting. I’ll look for a copy when I’m downtown. Is it in boxes? Or stacks somewhere? Or is it only being handed out? Is it funded by the Homeless Leadership Network? It’s handed out by various panhandlers on corners and downtown. It’s not funded by the Homeless Leadership Network, though they have mentioned wanting to do the same thing. We beat them to it 🙂 It’s critical that any coverage of the homeless issue come across unbiased. 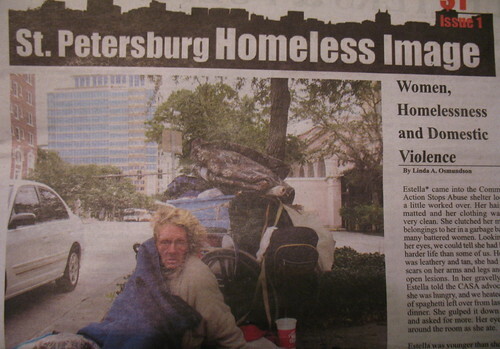 Where can I subscribe to the St. Petersburg Homeless Image paper? Thank you.